The human brain loves duality — good or evil, hot or cold. There’s a reason so much of our art, literature, and even the narratives we create about our own lives focus on the conflict between opposing forces. We love duality so much that we absolutely hate it when something doesn’t fit into one bucket. Is filmmaking an art or a business? The unavoidable fact that it’s both causes an enormous amount of stress and dissension, challenging virtually every working relationship in Hollywood at some point. Over time, successful screenwriters become skilled at balancing their own dual nature — left brain and right brain — to produce creative projects that also fit within the expectations of the audience. That ideal they’re striving for is what the father of industrial design, Raymond Loewy, dubbed the “most advanced yet acceptable” (MAYA) model. Loewy argued that people are constantly torn between a curiosity about new things (neophilia) and a fear of anything too new (neophobia). We want products to be exciting and bold, but also immediately comprehensible. In other words: to sell something surprising, make it familiar. To sell something familiar, make it surprising. The root of this seems to lie in what psychologists call the mere-exposure effect or familiarity principle. It’s been studied to the point of exhaustion and proven that we are simply more comfortable with shapes, words, faces, songs (etc.) we’ve seen before. The only time this effect is negated is when a subject recognizes that they’re being exposed to the same stimuli over and over. Is this ringing some bells? Hollywood is tasked with the similar balancing act of producing films that people feel comfortable with but still challenged by. We inherently love formulas. But we hate things that feel formulaic. As soon as we become consciously aware of the repetition, we’re turned off. I came across the concept of MAYA because it’s extremely relevant to my company. StoryFit uses machine learning and AI to analyze screenplays and identify popular elements. Why are some movies successful and others flops? Why do audiences respond to certain characters and not to others? Of course, as a result, I’m often asked whether our software won’t just inspire Hollywood to keep re-running the same tired stories and entrench sequel and reboot culture more deeply than it already is. The short answer is no, because recycling stories won’t produce the results Hollywood wants. For one short minute I thought I came up with the idea of MAYA on my own — pulling this theory from the results and trends we were developing at StoryFit. I had to laugh at the irony when I discovered the idea of familiarity-plus-surprise was a very familiar, yet surprising idea itself. The best-performing screenplays do combine elements of the familiar with surprises. In terms of audience enjoyment, books like Save the Cat! are correct to promote a “same but different” approach to screenwriting. But if you balk at the idea of writing based on a beat sheet, that’s fine — there are so many other ways of achieving familiarity. Think of a movie like Memento. It includes all the basic elements of a strong story and does very well in StoryFit’s algorithm. The main character has a clear goal — to find out who killed his wife. Many of the characters he meets are quickly identifiable as archetypes, such as Natalie, who appears at first as a damsel in distress but is soon revealed to be something akin to a femme fatale. And it’s these familiar story elements that serve as footholds, without which we would have great difficulty navigating the unusual storytelling format. Archetypical characters can help push the story forward quickly — and can simultaneously be the source of surprise later in the story. Think of Mrs. Weasley from the Harry Potter series. In the first few films, our software measures her at near 100 percent when it comes to embodying the stereotypes of motherhood. J.K. Rowling wrote her this way for a reason — she represents the mother Harry never had. And the fact that she is on the extreme end of the motherhood spectrum also leads to some wonderfully surprising moments in the later movies when her maternal drive leads to shows of anger, violence and a strength the audience didn’t necessarily expect. (Left) Gone With The Wind compared to “Man in a Hole” are closely aligned until the end. (Right) Mary Poppins Returns diverges sharply from “Icarus” but brings familiarity with well known character types. Archetypical plots are another framework that can add familiarity to a story, with room for surprises. I’ve included several examples from our analysis of major movies and their similarity to one of the six major plot lines. Kurt Vonnegut presented this theory in his masters thesis at the University of Chicago in the 1940’s. This idea was further developed by Andrew Reagan at the Computational Story Lab at the University of Vermont in Burlington. Notice how The Breakfast Club begins as if to present one archetype, but then very closely follows the “man in a hole” story. More recent movies: Bohemian Rhapsody is spot on the Oedipus archetype as is Deadpool to “Cinderella.” Some movies follow an archetype but add a twist at the end, like Gone with the Wind. Others, like Ferris Bueller’s Day Off, hit the core notes of the “rags to riches” story archetype, but with greater variance. When I think about the role software like ours can play, it’s not about hijacking the creative process. Rather, writers can use software to measure the story they’ve already written and gauge whether audiences will find it too familiar or not familiar enough. 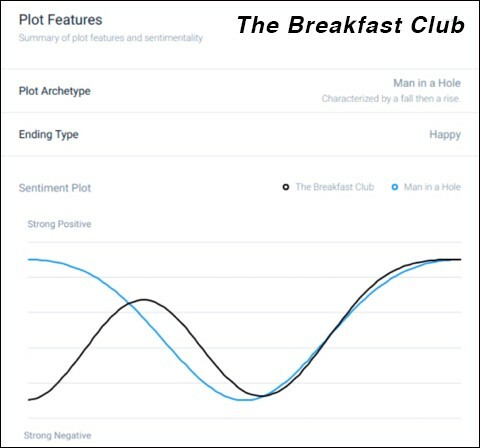 If it aligns 90 percent with the most popular movie from the last year, a smart writer will find ways to deepen or distinguish their archetypal characters, rework obvious plot points or add other elements of surprise to reduce the alignment. If it aligns only 10 percent with popular films of the past, they may consider simplifying the story or some of the characters to avoid confusing the audience with something too new (remember our innate neophobia). It can also serve as quantitative proof that the writer is on the right track. There’s nothing more satisfying than being able to show a studio executive that your screenplay is, in fact, poised to make them a great deal of money despite the fact that it’s entirely original content. The monumental struggle of cinematic artists is reaching that MAYA threshold, and measurement can only make it easier. So when you’re trying to do something new and truly great, take inspiration from the past but don’t copy it. Filmmaking is inextricably both art and business. That’s an uncomfortable idea at first, but then again, all great ideas are.